A few years ago I met the people behind the Lechuza company at the Independent Garden Center Show. Lechuza makes self-water (sub irrigation planters) that are really stylish and modern. These containers work the same way as the Grow Box from Clean Air Gardening and the Garden Patch Grow Box, but are a lot more fashion-forward. This year, Lechuza sent me two of their self-watering planters for free to try in my container garden. So far I've tested Cubico Cottage window box planter in my porch garden. The Cubico Cottage window box planter is 19 inches long, 7 inches deep and 8 inches tall. This is one of the nicest-looking self-watering window box planters I have come across. The plastic looks like woven wicker and seems to be standing up to the sun pretty well and not fading. It is small enough that over the winter I used it indoors in a windowsill to hold some houseplants, when spring came I brought the container outside and replanted it with annuals. 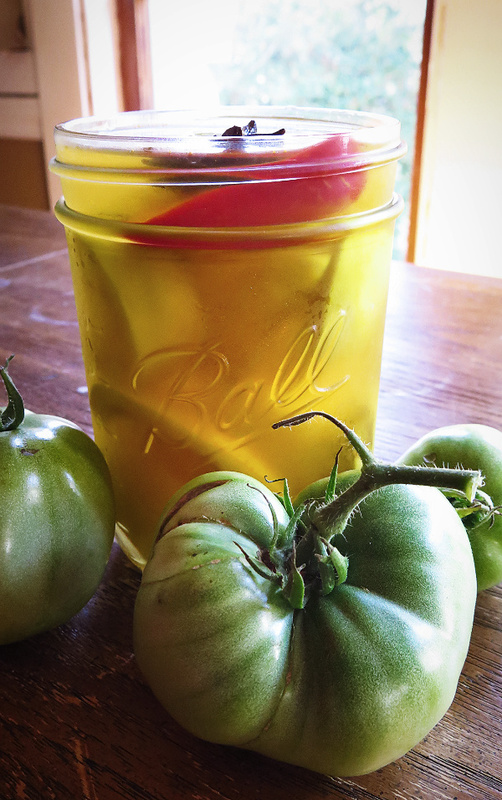 There isn't much assembly required for this self-watering container. There's a handled insert that allows you to pull out the liner for easy access for planting and switching out spent plantings. 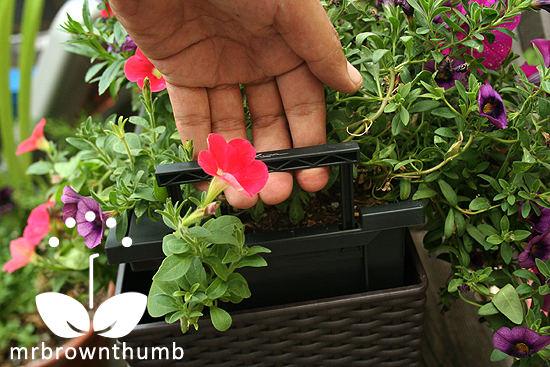 The planter comes with hardware that you can attach to the raining of a deck or porch. When you pull out the insert you can leave the water reservoir behind and just slip the liner back in place. 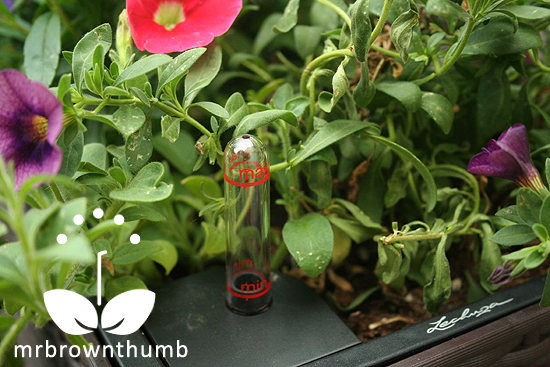 The water gauge shows you how much water there is in the reservoir of this self-watering container to avoid drowning the roots of your plants . The underside of Lechuza's window box planter has a plug that you can remove if too much water collects in the reservoir during rains. I find this feature extremely helpful because it allows you to use the window box planter inside and outside the garden. Recently the weather forecast called for rain so I went out to the back porch and removed the plug overnight so that water wouldn't collect and replaced it in the morning. I usually try to avoid over planting containers because too many plants and your container dries out as the various plants compete for moisture in the soil. The Cubico Cottage planter pictured above is planted with 14 annuals and I haven't had a problem with the window box drying out. These annuals were also free plants to trial and write about. 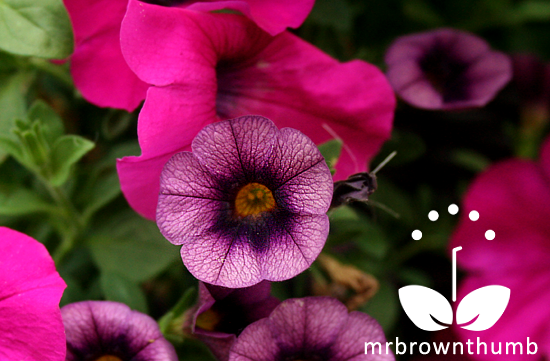 There's five Easy Wave® Neon Rose petunias from the Ball Horticultural Company. 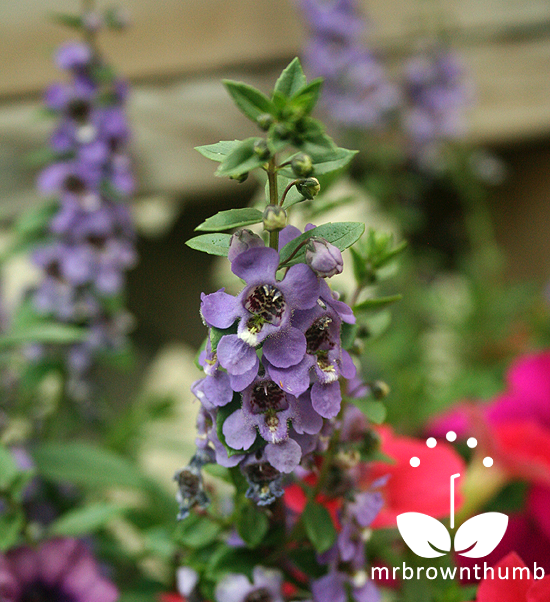 Four Serena® Blue Angelonias from the Ball Horticultural Company. 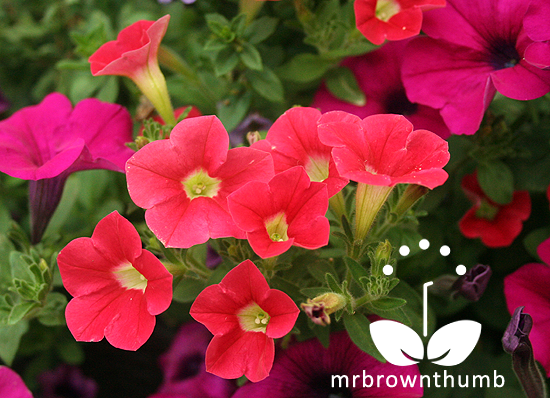 Three Shock Wave® Coral Crush petunia from the Ball Horticultural Company. The color of these is a lot nicer in person, I'm just not very good at photographing reds. 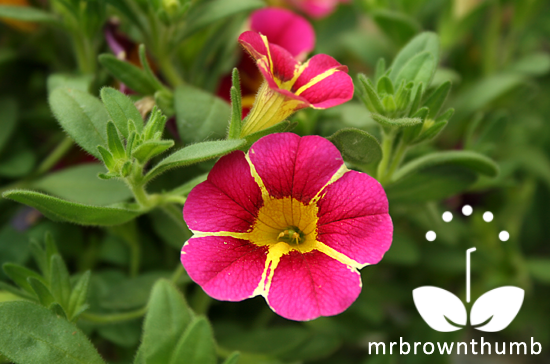 One Superbells® Cherry Star Calibrachoa hybrid from Proven Winners. 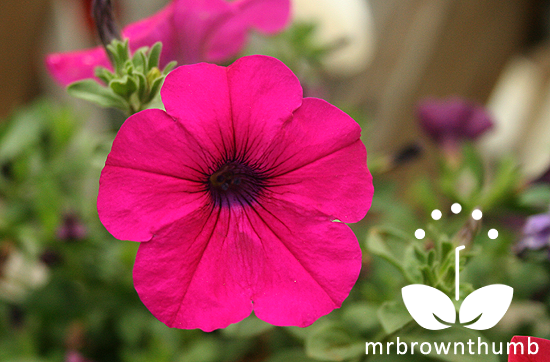 One Superbells® Grape Punch Calibrachoa hybrid from Proven Winners. The Cubico Cottage self-watering window box planter from Lechuza is a great little planter that hasn't once dried out in the extreme heat of full sun exposure. It is an especially attractive choice if you're looking for sub-irrigation planters that go beyond the orange plastic that seems to dominate this garden niche. I love my Grow Boxes, but after using this self-watering container I wonder why they can't all look like this. Also, all of these sub-irrigation planters don't come with liners that make switching out the plants easier. The Lechuza company makes self-watering planters in a variety of sizes, shapes, colors and textures. You're sure to find something that works with your garden's style. My only problem with the Cubico Cottage window box planter planter is that I only have one of them. I like that - a lot! Might have to investigate further! BTW - love your trial plants. I have the Coral Crush and Angelonia as well. I think the Crush is camera shy, because you're right - photos just don't capture the --- ummm--- radiance? reflectivity? neon essence? Shoot, you're the writer... what word am I looking for??? 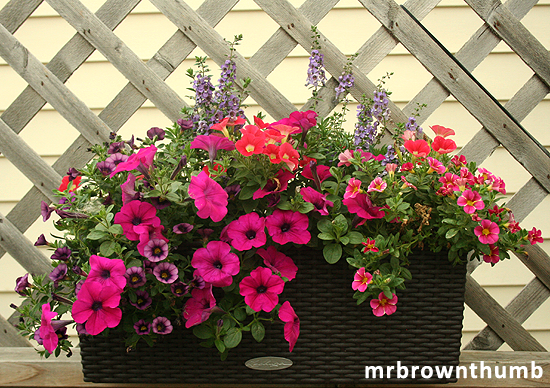 Of both the planter and those amazing petunias/cali's. 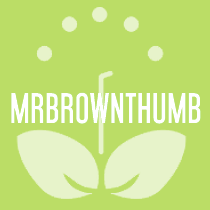 Self-watering is definitely the way to go - thanks for your fair assessment of this product. @Tom, LOL. I have trouble finding the right word for it too. I think radiance does a pretty good job of describing it. In general I'm not good at capturing the true colors of reds with my camera because I'm too lazy to learn how to adjust the settings. The real color of Coral Crush is spectacular. @Jennifer, Thank you for stopping by and commenting Jennifer. Don't be jealous, hang out on Twitter and you'll be getting offers for plants and products to review too. Although, the container came about as a result of a convo I had at a trade show with the owners/marketing team of the company. What an absolutely gorgeous planter! Very nice. I have a Lechuza store right down the street! If only they weren't so darn expensive...but well worth the money I'm sure! They are gorgeous!!! @meemsnyc, Thanks it is very nice. Definitely the most stylish self-watering planter I've used. @julie, They have stores? Wow, I'm going to have to look out for them and visit one to see all of these self-watering containers in person. @garden girl, LOL, the sun is an advantage when there isn't too much of it. During the heatwave I was jealous of all your shade.